Component Video Cables with the AV-3 or AnCo Cable Component Video (Y/Cb/Cr) is a better standard as it separates one step further than the S-video which in turn is better than the Composite and S-video. Component video cables with 3 parallel Anco cables for highest transfer quality. Note! Component video is not compatible with RGB. Y signal contains luminance- and synchronising information. The component connectors are usually marked YPbPr. Sometimes they are wrongly marked Y/Cb/Cr (digital component), YUV or RGB. Component Video is a high quality transfer technique, and can handle resolutions up to 1080p. 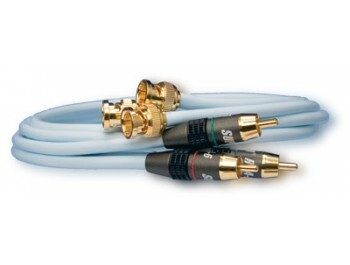 SUPRA component cables are available in different combinations with RCA and BNC. Anco is for high quality demand and/or long cable runs. The signal is separated into three individual coaxial cables of very low loss. (0.6/100m) All connectors are shielded. Application example: DVD to TV/Projector. Our best component video cable. AnCo 3RCA-3BNC is an interconnects with Supra RCA-6 & BNC-6 plugs. Application examples: DVD to LCD/Plasma. fråga om "Supra Anco Komponentvideo 3xRca till 3xBnc 1meter" är framgångsrikt Submitted.